Since the innocent residents of Parachinar have been suffering for over 5 years now. There is a blockade of basic necessities of life inside Parachinar e.g. food, medicines etc. Terrorists kill those who attempt to go to Parachinar. There are several incidents where cars and trucks are burnt by these Takfiri elements. Government of Pakistan has always turned a blind eye towards the demands made by the residents of Parachinar and the supporters of human rights throughout Pakistan. False promises and unfulfilled commitments by the Government have compelled the general public of Pakistan to feel for the oppressed living in Parachinar. To fulfill this responsibility, MWM has decided to take an aid caravan to Parachinar. Now the civilians of Pakistan will help the oppressed of Parachinar. Freedom lover people of Pakistan have donated many goods and money to their brothers and sisters in Pakistan. May Allah accept their contribution. MAY ALLAH PROTECT THIS CARAVAN AND THAT THEY REACH PARACHINAR WITH ALL THE FOOD SUPPLIES, MEDICINES, AND OTHER GOODS OF USE. MAY ALLAH BRING THESE DIGNIFIED AND GLORIOUS BELIEVERS BACK HOME SAFE AS WELL. Updates about the aid caravan headed towards Parachinar, Pakistan by Majlise Wahdate Muslimeen. This peace caravan's aim is to provide food supplies and medicines to the oppressed people of Parachinar. These residents of Parachinar are suffering from the blockade of basic necessities of life for more than past 5 years. The government of Pakistan, intelligence agencies, and military has been turning a blind eye towards the oppression done on these innocent residents of Parachinar. The list of crimes committed against the civilians of Parachinar, including women and children, is exhaustive. Finally the men of honor from different areas of Pakistan, under the supervision and leadership of pious scholars (ulama) have decided to go and help their oppressed brethren in Parachinar. May Allah protect them from the evil of the terrorists. Ameen. Asian Caravan Ship Departing Towards Gaza Workers Reciting Anthem - Persian http://fars.tv/videos/2919/Ø¨Ø§Ø±Ú¯Û?Ø±Û?-Ú©Ù?Ú©-Ù?Ø§Û?-Ù?Ø±Ø¯Ù?Û?-Ø¨Ù?-Ú©Ø´ØªÛ?-Ø³Ù?Ø§Ù? 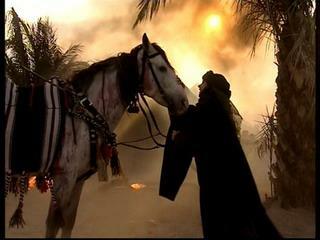 A movie on the aftermath of Karbala tragedy. Special report on Eid al-Ghadeer (Eid-e-Ghadeer), when on his return journey from Hajj, Prophet Muhammad(S) halted the entire caravan in the desert to noiminate his cousin and son-in-law, Imam Ali ibn Abi Talib(A), as his successor. Eid al-Ghadeer is also known as the Eid of Brotherhood and the Eid of Wilayah. La historia de la peregrinación forzada que hubieron de realizar los familiares del Profeta Muhammad (BPD), y sus descendientes (as), tras la masacre del Imam Hussain (as) y sus 72 compañeros en Karbala. Esta película narra los acontecimientos que tuvieron lugar en los 40 días que transcurrieron desde su captura en Karbala hasta su llegada a Damasco, donde fueron presentados ante la corte del sanguinario Yazid, hijo del califa criminal Muawiya. Su padre Abu Sufyan y su madre Hint fueron otros grandes tiranos, viciosos y sanguinarios, que llevaron a cabo la tiranía contra el pueblo musulmán y contra la familia del Profeta Muhammad (BPD). En esta Caravana del Orgullo aparecen retratados los auténticos protagonistas y héroes de aquella famosa batalla en el día de Ashura. Zaynab al-Kubra, hermana del Imam Hussain y Ali ibn al-Hussain, hijo del Imam Hussain (la paz sea con ambos) realizan fantásticos y estremecedores discursos e intervenciones a lo largo de este viaje iniciático de 40 días en los que los verdaderos seguidores del Único Dios hacen frente a las injusticias y humillaciones. Esta película narra una parte importantísima de la historia islámica, que te sea de provecho, insha-Allah. A video report of GMJ-Asian caravan from NewDelhi to south Lebanon.